Adam Cole is who Billy Joel would have been if he hadn't made it as a rock star. Adam Cole does what Albert Einstein would have done if he hadn't been a scientist. Philosopher on the subject of learning, novelist whose plots all wind up involving music, a writer of imaginary essays, old-fashioned songs, and poems that could have been published a hundred years ago, Adam is that someone you've never heard before and may never see again. Adam Cole began as a musician playing with such jazz greats as Nicholas Payton and Marian McPartland. After acquiring newfound family responsibilities, he worked in the public schools for eight years as a Choral Director, becoming in just three years the Chair of General Music for Middle School for Fulton County Schools. Recognizing the limited reach of his work as a classroom teacher, Mr. Cole decided to create opportunities through his books, music, and workshops whereby anyone at any level could transform their lives through music. Mr. Cole is one of only a few thousand Guild Certified Feldenkrais Practitioners® currently licensed to work in the United States. He uses his specialized knowledge to guide people to greater potential as musicians. 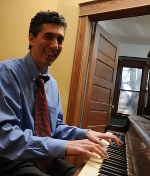 He has a Master of Music degree from Georgia State University, and a Bachelor of Arts degree from Oberlin College. He speaks to groups about his own journey and of the many ways in which we can develop from children into mature, engaged people truly alive to the world around them. Mr. Cole studied piano with Geoffrey Haydon, Ted Howe, and Neal Creque, conducting with Alan Raines, Patrick Freer, and Daniel Moe, and composition and orchestration with Nicholas Demos, Curtis Bryant, and Dennis Eberhard. He is the author of two nonfiction books on music: Solfege Town and Ballet Music for the Dance Accompanist. He has also written four novels, a number of books for children about music, and several short-story collections. As a composer, Mr. Cole has written for a variety of instruments. His orchestral piece, Themes Off A Variation, a tribute to Robert Schumann, is archived at the Schumann House in Zwickau, Germany.